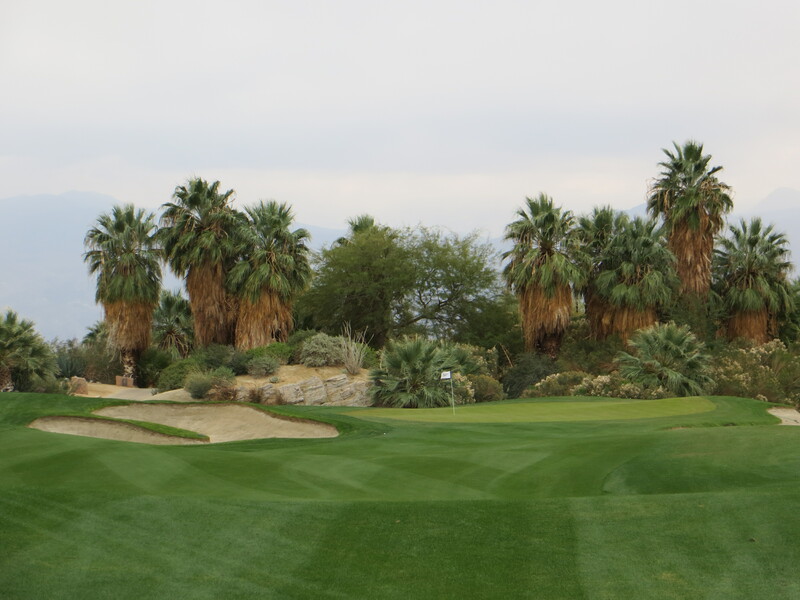 The Firecliff Course at Desert Willow is a desert layout as pleasing as any you will ever lay your eyes on. 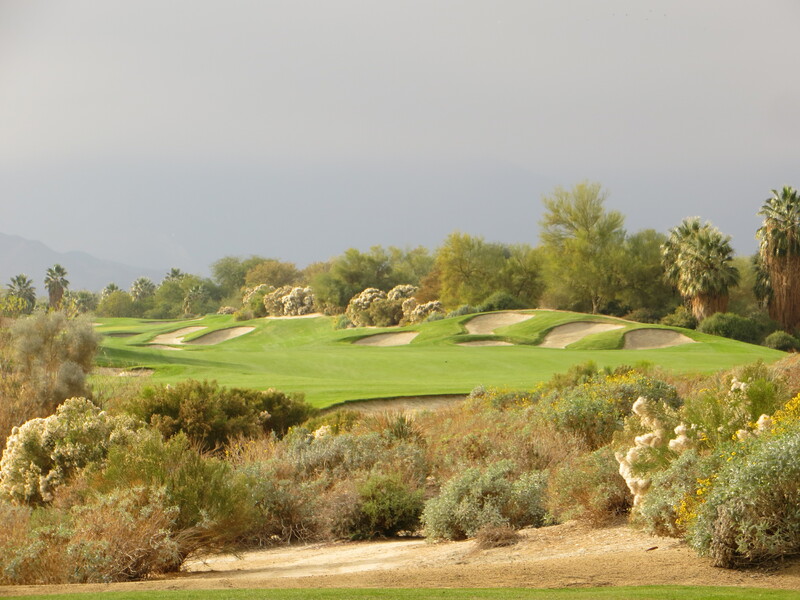 Hurdzan did a marvelous job creating holes with a desert flavor that is not Arizona target golf. 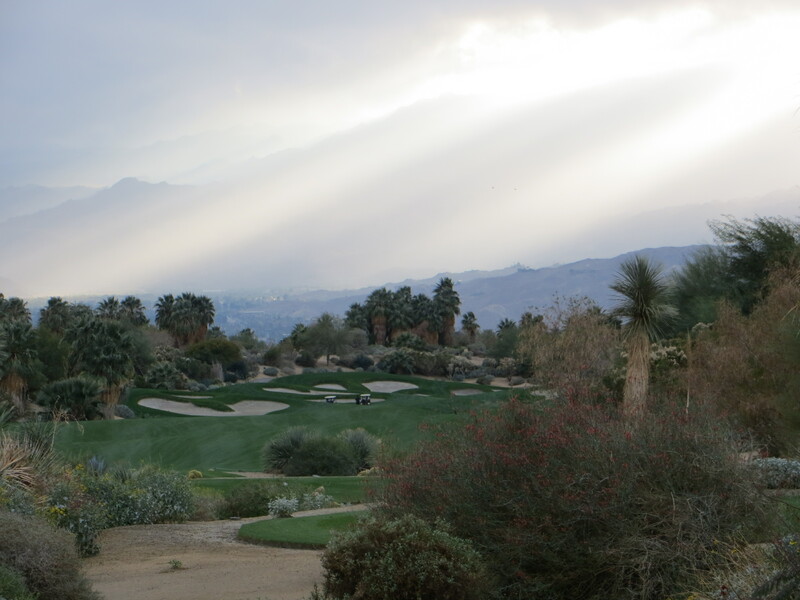 Palm Desert may be an arid flat pancake but you would not know it after the four hours you spend playing this course.The bulldozers had their way raising topography from the desert that is lyric and pleasing to the eye. The designers pulled from all sides of the flora palette to create supporting sideshows. 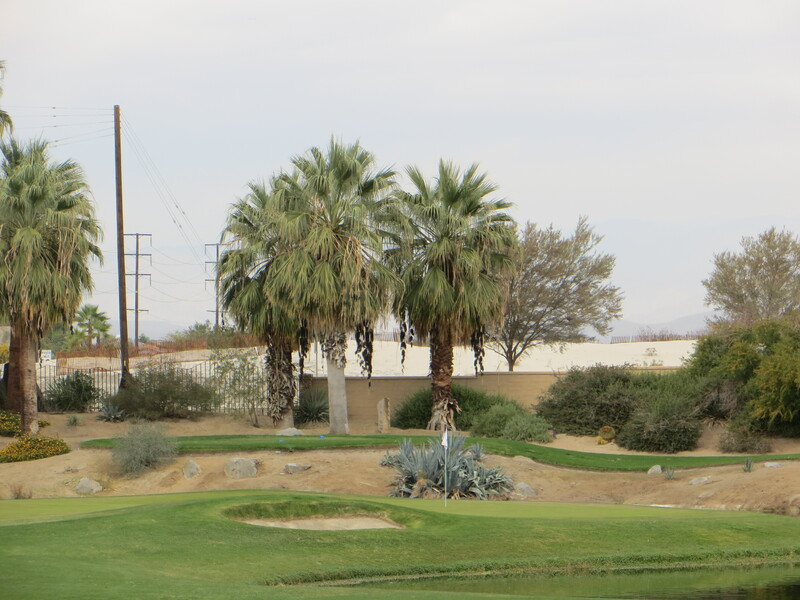 The landscape artist must have been paid a bundle because there are astonishing compositions of desert flora that surrounds every tee, fairway, and green. Bring your digital camera and a large storage card because you are coming home with a load of photographic memories for the family scrapbook. 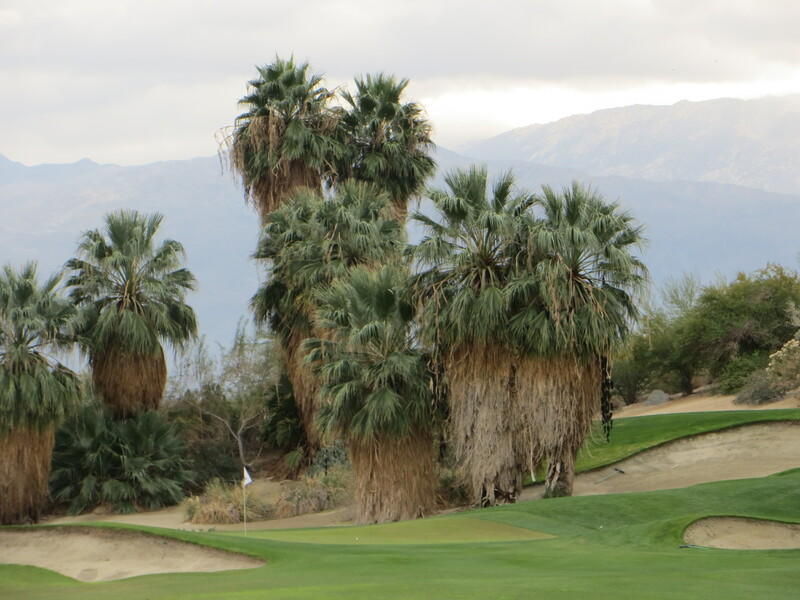 Lush fairways, framing palms, and ominous mountain back drops-what a formula. These holes have topographical character of a foothills mountain course even though the mountains are miles away. Well positioned every tee box gives a full view of the challenge ahead. There is an insane amount of bunkers and waste areas full of desert nasties but if you control your shot lines it is a negotiable challenge. A master of obfuscation Hurdzan did a great job in masking the severity of challenge throughout the holes. The short holes are deceitfully difficult and the long holes have plenty of give to them. This is a course where you must plot your path on each hole carefully to mitigate the risk of pummeling your scorecard but there are times when a bold shot can give you a chance for a pleasing result to brag about over dinner. The slope of 133 from the Blue markers is real but the 6700 yards itself is not overwhelming. I noticed that often the upslope in the landing areas off the tees can steal some roll out especially on the back side where there is a more rolling topography. The green complexes are ingenious, many perched on hills or ledged over waste areas or bunkers so getting a proper angle of approach is very important. On average the greens are small with sweeping shoulder slopes not tiers so you will spend a good part of the day scratching your head wondering why approach shots continue to separate from the flag. 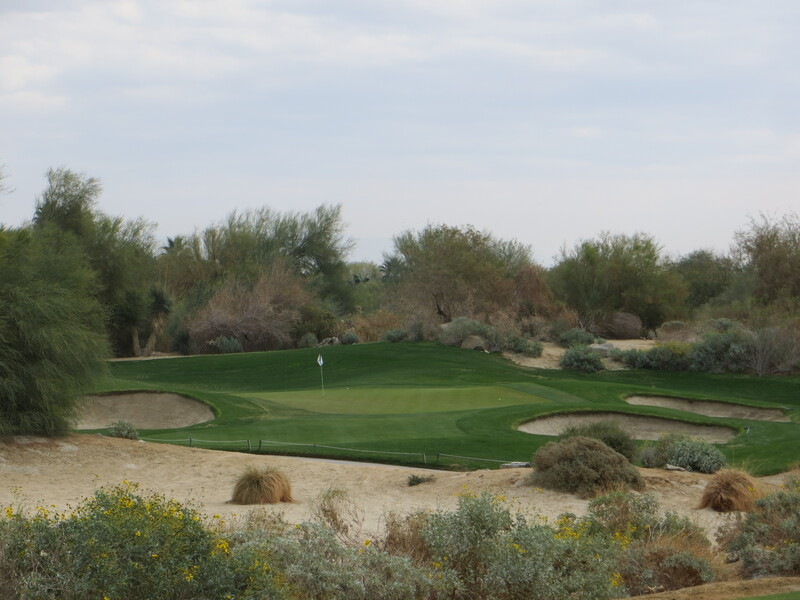 The sand and the scrub add beauty and challenge at the Par 3 3rd. The lush surrounds of the first tee box sets the stage for the day. 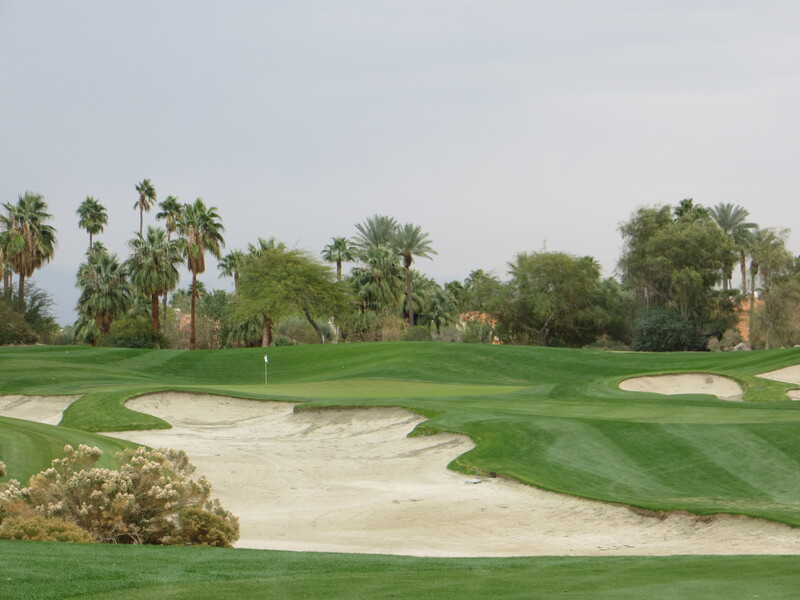 A beautiful sweeping par five stretches out in front of you ambling up to a green set in a hollow beautifully appointed by desert vegetation. 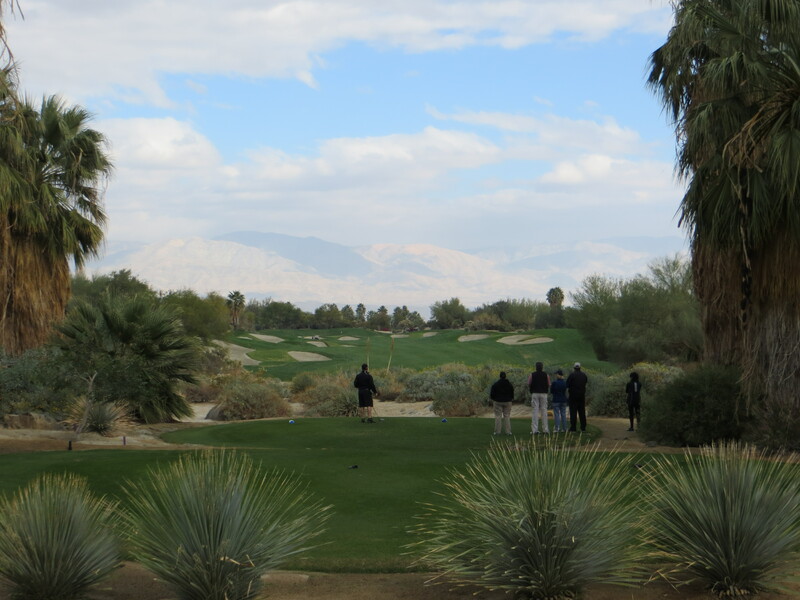 Another stunning view off the tee box on the second is framed by the towering mountains that surround the Sonoran Desert. The terrarium adjacent to this green and the carry wilderness on the Par 3 third are a signature look for the Firecliff Course. The approach to the short 6th should come with a warning label. The pace of the challenge ramps up quickly with back-to-back strong four pars on the fourth and fifth. These are holes with lots of trouble encroaching on the sides but controlled lines make them eminently playable. The short Par 4 sixth is where the large number lurks. After a position fairway metal off the tee the peninsula green setting and sharply slopped putting surface is an ice bucket challenge if you get too ambitious on your approach. Next is a roller coaster Par 5 that should not present any real threat to the scorecard but what follows to the turn will test your patience. 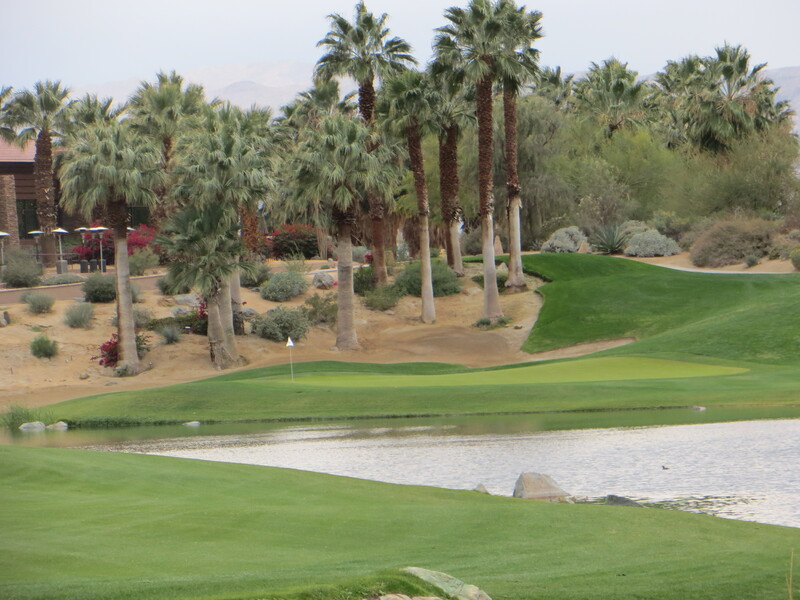 Another distracting visual frames the 8th green and the adjacent lagoon. The Par 3 penultimate holes on each side share the astonishing surrounds of what looks like Gilligan’s lagoon. 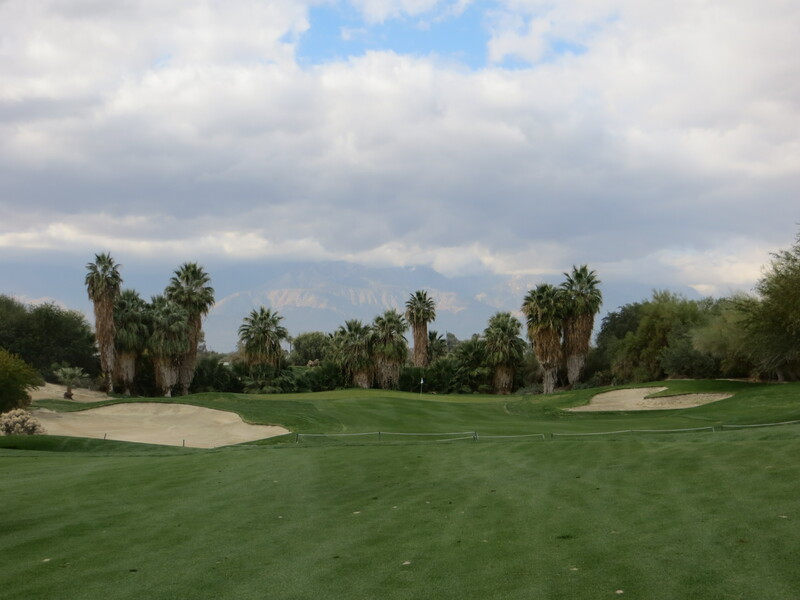 The 8th is a mere short iron across the hazard to a green set in front of majestic palms and beautifully landscaped sand and flora. This visual is more than distracting so try to keep your focus. Playing into the 9th and 18th the stature of the clubhouse is revealed. The view going down the 9th and 18th is equally engaging with the clubhouse high above the green complexes reminiscent of the finish at Grayhawk in Scottsdale. Water of the left impinges the long approach shot to a narrow green opening so prudent course management may call for a lay up for a pitch and a putt to keep the momentum going. The inward nine begins with the same look….just more rolling terrain to deal with. 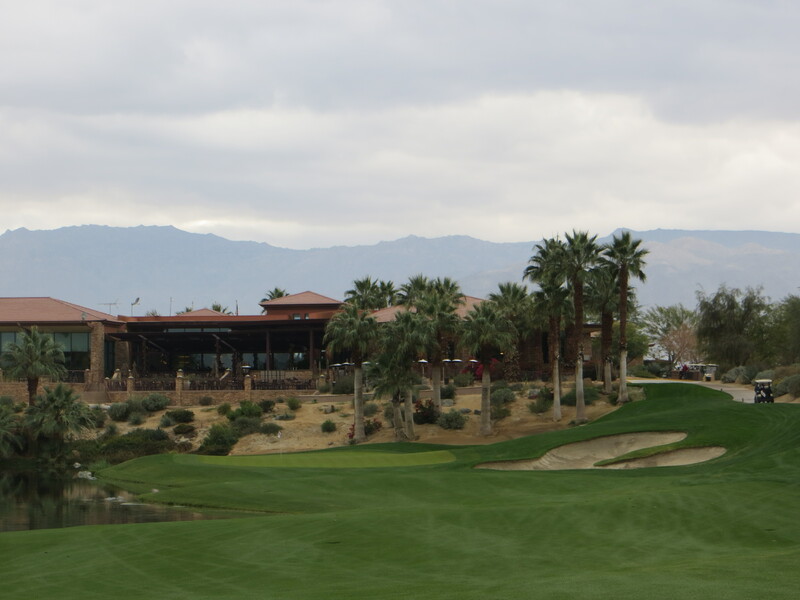 Grab a wrap and a protein bar from the snack area in the clubhouse because an awesome stretch of holes are awaiting. The view off the 10th tee is another jaw dropper as a difficult long Par 4 climbs a ramped hill to a table top green complex. With a long club in hand the abrupt slope to the green will reject timid approach shots so do not hold back. 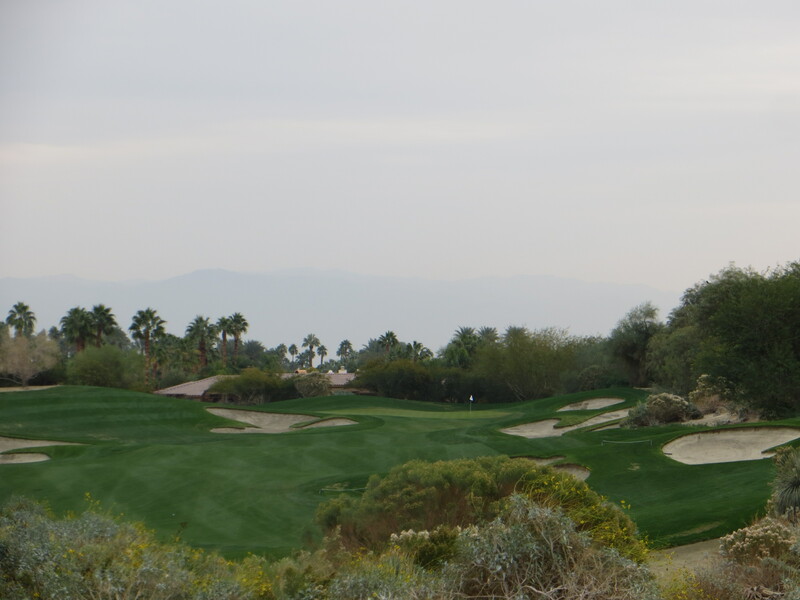 The 11th is another long Par 4 with a blinded carry tee shot over the desert wilderness. This leaves a long approach to a green complex parsed from the side hills by deep grassy depressions on each side. A bogey-bogey start on this side is not something to be worried about. Full carry required across the long waste area to 12 green. After a drive into the upslope of the fairway on #12 you are left with an intimidating carry across a massive sea of sand and waste to the green perched on a hill. This is another Kodak moment-you could swear you are in Hawaii and the blue Pacific is just beyond the green. The Par 5 13th would feel right at home at Pine Valley. Two of the more visual holes of the day follow in a Par 5 and Par 3 respectively. The look up the long 13th is inspiring and intimidating. This is a hole where you have to pick a line and trust it because it is much more user friendly than it appears to the eye. 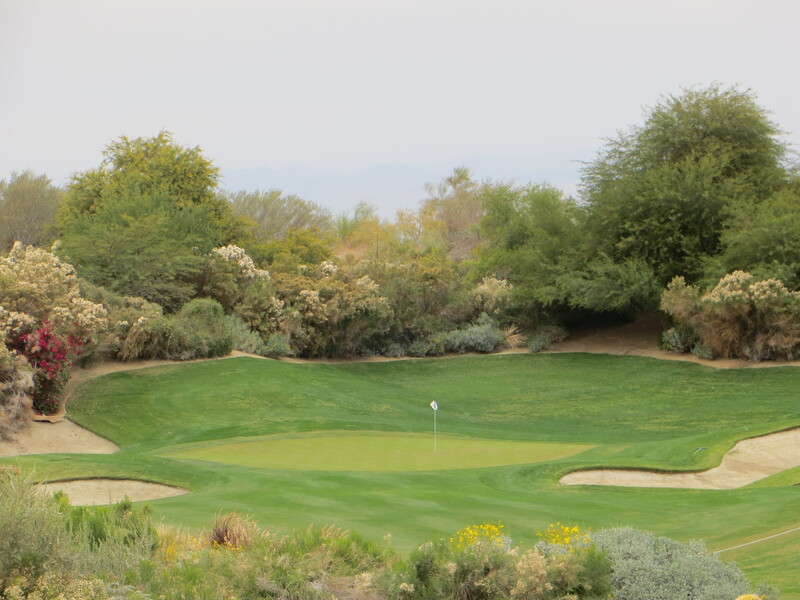 The subtle 14th is a soothing alcove green setting with a large desert accent up the left. You may just want to get into the lotus position on this tee box and chant your mantra for about 20 minutes to settle the mind for the challenging stretch to the house. How disarming is the tranquility in this presentation into the 14th. At first glance the short Par 4 on #15 appears innocuous but negotiating the approach or up and down save into a precipice green with a small pachyderm buried in the back left corner is fraught with difficulty. A piece of Pine Valley follows on the sand scary 16th which has serpentine sand pit covering the last 50 yards left and shrouding the green. Soothing if the carry wasn’t over water right and sand left into a very tight green. Returning for a second taste of Gilligan’s lagoon on 17 the longer length of the club in your hand makes it incrementally more difficult. Once again don’t get lost in admiring the surrounds because this is a very hard long iron or hybrid to hold on line to the diagonal setting of the green. There is a sureal feeling looking across the mishugas down the 18th fairway. The play down the last is a perfect conclusion to a thrilling round of golf. A truncated Par 5 that threatens both your second and third shot can be a real thriller if the back nine Nassau depends on you making par or better. Try to ignore all those people on the clubhouse patio with sentiments against your success, they have witnessed legions before you try to get to the house unscathed. Once you finish putting out and drive up the hill to the doorstep of the clubhouse take a second to stop and look back up the finishing holes. There is one last Kodak moment from a memorable golf course experience that will prod you to return for more. This entry was posted in California by moegolf. Bookmark the permalink.